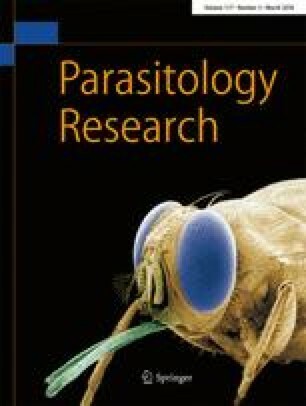 Chiropteran mammals worldwide harbour trypanosomes (Euglenozoa: Kinetoplastea: Trypanosomatida) of the subgenus ‘Schizotrypanum’ in the classical sense. Latterly, these trypanosomes have been referred to as members of the ‘Trypanosoma cruzi clade’ as their phylogenetic relationships, structure and life cycle conform to T. cruzi, parasitising various terrestrial mammals as well as humans in Latin America. Little is known, however, about the trypanosome species in Asian bats. During a survey on Borrelia spp. in the Eastern bent-winged bat (Miniopterus fuliginosus) living in a cave in Wakayama Prefecture, Japan, incidental proliferation of trypanosomes was detected in two of 94 haemocultures. Squat or slender trypanosomes that proliferated in the cultures were 7.5–20.5 μm in length between both body ends and 1.0–3.8 μm in width with/without free flagella up to 14.5 μm (n = 29). The nucleotide sequences of the small subunit ribosomal RNA gene (SSU rDNA; 2176 bp), large subunit ribosomal RNA gene (1365 bp) and glycosomal glyceraldehyde-3-phosphate dehydrogenase gene (gGAPDH; 843 bp) of the present isolates were characterized to clarify their molecular phylogenetic position in T. cruzi-like trypanosomes. The newly obtained SSU rDNA and gGAPDH nucleotide sequences showed the highest identities with Brazilian and European isolates of Trypanosoma dionisii of the T. cruzi clade, ranging between 99.4 and 99.7% or between 95.6 and 99.3% identities, respectively. Although multiple T. dionisii isolates from the North and South American continents showed the closest molecular genetic relatedness to the present Far East isolates, only short SSU rDNA segments of the former isolates were deposited. Therefore, a definitive conclusion cannot be made until full nucleotide sequencing of at least the American isolates’ SSU rDNA is available. This is the first confirmation of a Far East distribution of T. dionisii, demonstrating a wide geographical distribution of the species in the Eurasian and American continents with a limited nucleotide variation.